Once installed you can launch it. The GUI is very simple, just one window, with two tabs. This just shows all the pictures that are in the rotation. 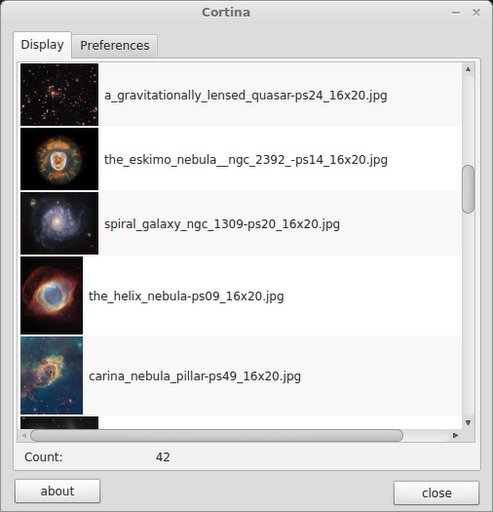 Preferences, very simple, autostart or not, how much time between changing, it will really change every second, I just tried, but it will eat up the CPU, was running at about 40%, though some of my pictures are several MB, and very high resolution, I've got a bunch of pictures from NASA. There are more pictures than what I've linked to here, but this is where I grabbed mine from. I've tried other programs in the past, and even just modifying the .xml file myself, but I've never gotten anything to work, this though just worked, very simple and easy. 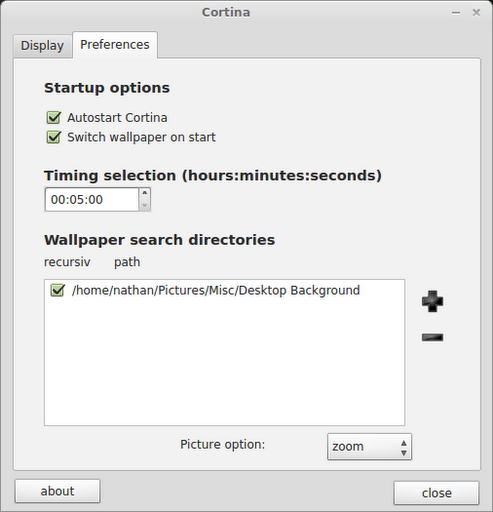 There is a notification icon that sits on the menu bar, right clicking brings up a few options, delete current picture from disk, open GUI and exit. The delete button is actually nested under another option, so there should be no chance of it being accidentally clicked. A left click changes the background, so if you have something in the rotation, and somebody comes over, you can quickly change the background, not that I'm suggesting you should have any images that you would want to hide from anybody, or that if you had those types of images you should have them on a wallpaper slide show, but the functionality is there. And there you have it, a really quick, basic, and simple overview of Cortina. Try it out and let me know what you think in the comments.